Until a few years ago, I thought “Sweetest Day” was the worst retailer ruse that could be foisted upon us, the smartest scam manufactured by marketers in a ceaseless effort to separate unsuspecting customers from their hard-earned cash (or credit). 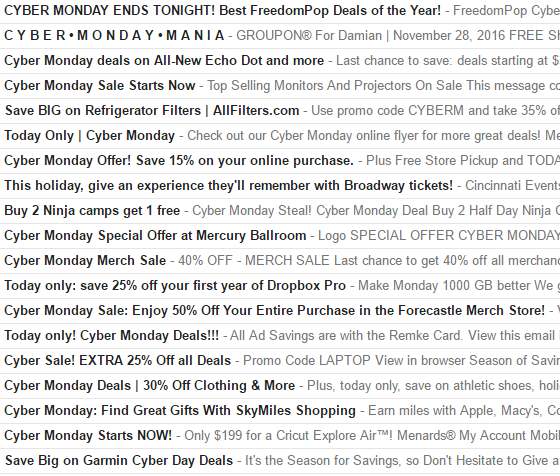 But Cyber Monday has taken it to a whole new level… or an all-time low. You don’t really need that new gizmo. But 42 million Americans are food insecure. 564,708 people in the U.S. are homeless on any given night. 783 million people around the globe do not have access to clean water and almost 2.5 billion do not have access to adequate sanitation. Please find a charity that speaks to you, and open up your heart and your wallet. Not just today, but all year long. A pledge pin? On your uniform? 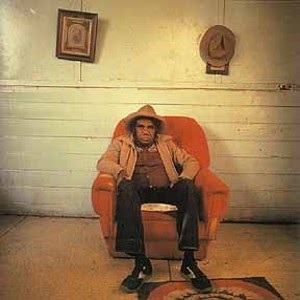 This is Buffalo Tom. 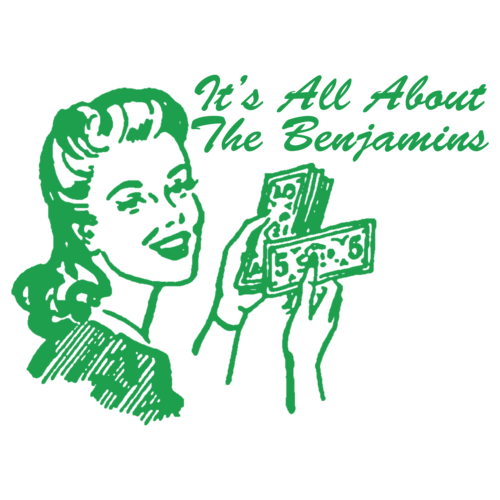 One of my all-time favorite bands. I soon listened to the rest of that brand-new album, Let Me Come Over, and thought every tune was a gem. They won my heart and we’re still together. 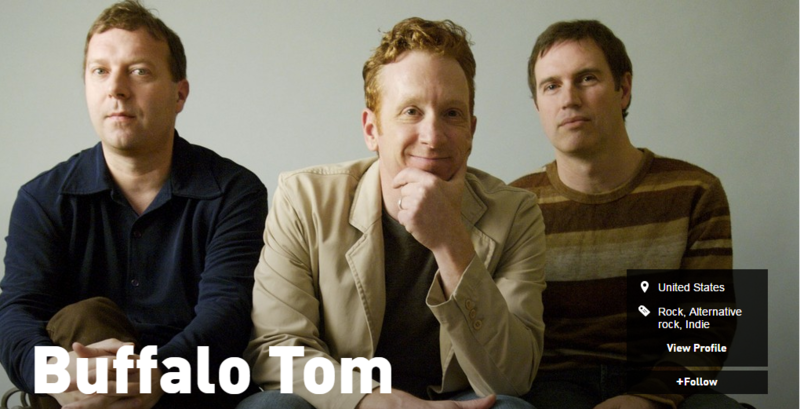 Nearly a quarter of a century later, Buffalo Tom is still rocking. Oh sure, they’re all married with kids, and have real jobs now (lead singer Bill Janovitz sells real estate near Boston). But they have continued to put out albums that sound great. For a mere $9.99, you can get a digital download of the new album. If you don’t like it, I’ll refund your money. Never thought I’d see the day when new episodes of Gilmore Girls were available. My wife and I loved watching the show when it was on the WB (remember that wacky network? )and later the CW back in the early aughts. It always had a reputation as a “chick flick” type of show, but that was lazy pigeonholing, probably because the cast featured very strong female characters. 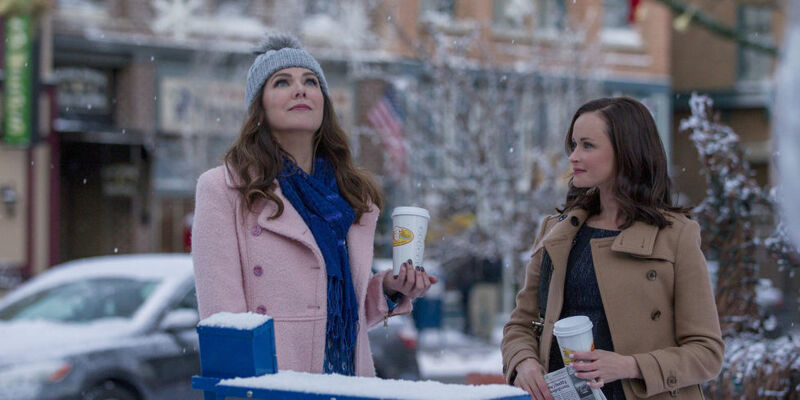 In my humble opinion, it was one of the best written shows going, and show creator/producer/writer Amy Sherman-Palladino and her writing partner husband Daniel are true geniuses. 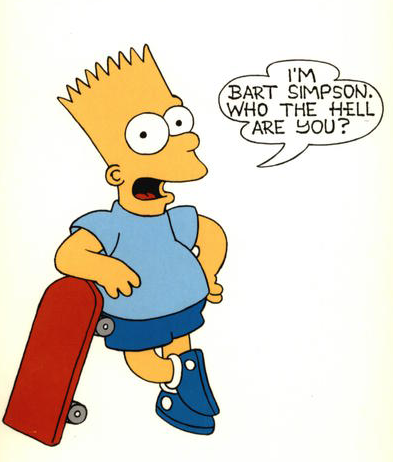 The show never made much of a dent in the ratings during its seven seasons on the air. 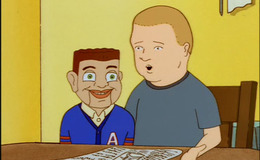 But the episodes hold up very well (due to the strong writing, naturally), so it gained a new generation of fans thanks to the magic of Netflix. So much so that they “got the band back together” and created four new 90-minute episodes which debuted on Netflix yesterday. The Tom Waits song “Time” was a perfect choice for the scene at Richard’s funeral. Grant-Lee also chased off a competing town troubadour (his sister), played by Louise Goffin (Carole King’s daughter, who duets with her mom on the show’s theme song). But my favorite moment was when Grant-Lee was featured later in the show, doing a Fountains of Wayne tune, “Valley Winter Song.” It was probably only 10 seconds of screen time, but it truly made my day. Here’s the original from Fountains of Wayne, it first appeared on their fantastic album Welcome Interstate Managers. Thank you Amy Sherman-Palladino for a wonderful Black Friday gift for every member of your cult audience: more heaping helpings of greatness. And thank you Netflix for giving Gilmore Girls a new home. 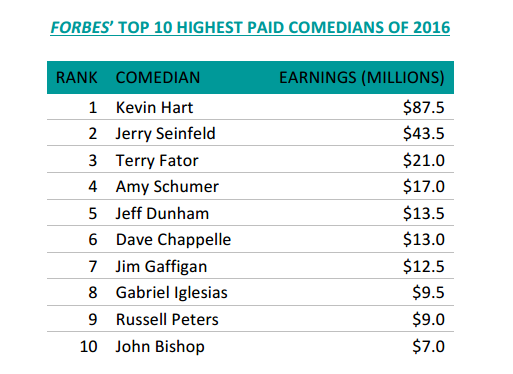 On the Forbes list of the highest paid comedians for this year, there are a few surprises… head-scratchers, even. It’s not surprising at all that Kevin Hart tops the list. Seinfeld is a no-brainer as well. But I actually had to Google “Terry Fator” because I’d never heard of him before… and I consider myself a comedy aficionado. Turns out he is a ventriloquist/impressionist who won Season 2 of America’s Got Talent and parlayed that into a standing gig at the Mirage in Vegas. 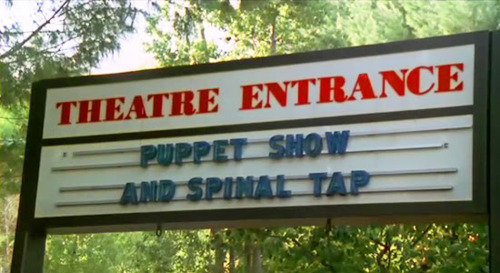 Who knew that having puppets in your act could be so lucrative? 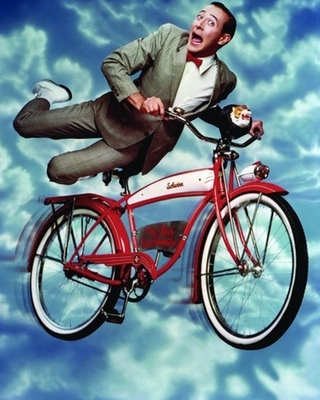 Another dude that plays with dummies, Jeff Dunham, was also in the top 5, raking in a cool $13.5 mill. And I threw away my sock puppets when I was a kid. Who’s the dummy now? Names 9 and 10 were unknown to me as well, but maybe that’s because I’m xenophobic (it’s OK, so is the president-elect). Russell Peters is Canadian and John Bishop is a Brit. Forbes even wrote about Russell Peters’ lack of name recognition. I suppose Terry Fator, Russell Peters and John Bishop have millions of reasons to not care about whether I’ve heard of them or not. A few things I’ve read recently have really rung true, and I think they’re worth pondering before we share food and fellowship with family and friends today. So yes, today is a day to be thankful. But every day is a day to be kind. Happy Thanksgiving! I want to be adored (just like The Stone Roses), but I don’t want to be “doored” when I’m riding my bike. 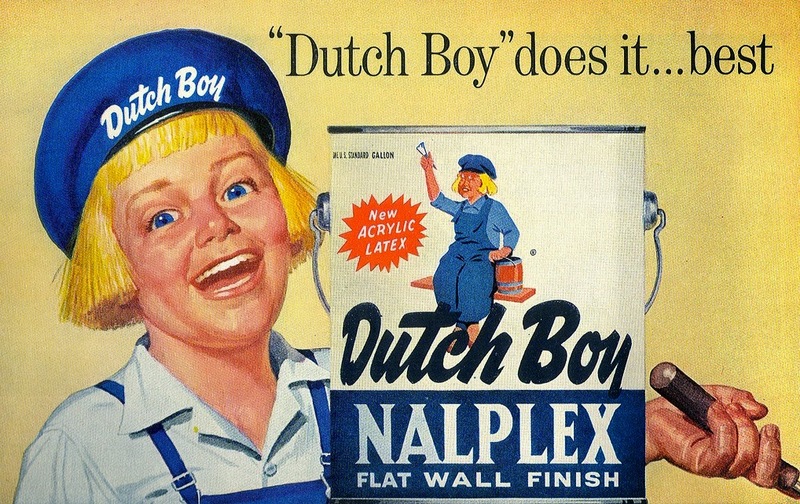 Windmills, tulips, wooden shoes and saving cyclists’ lives. Thank you Holland! And yes, that’s Mr. Ice Castles on the left and “Ralph Malph” on the right. Even in the 80’s, when Walkmans were all the rage, the Reese’s beat went on. 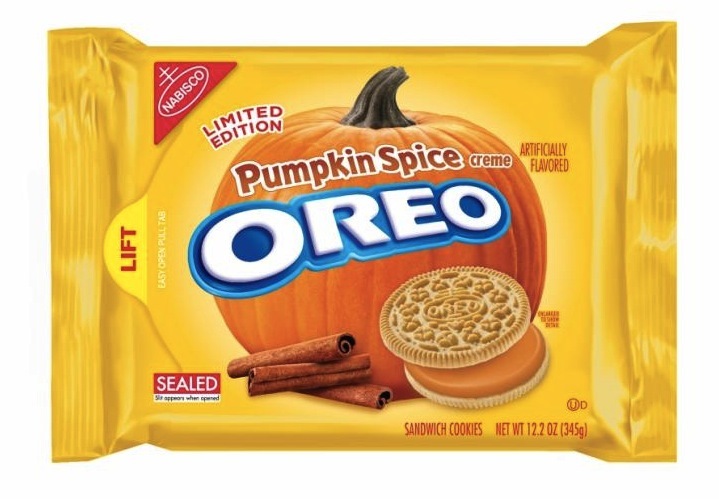 But not every combo works as well as PB and chocolate. Here’s Exhibit A: Swedish Fish flavored Oreos. 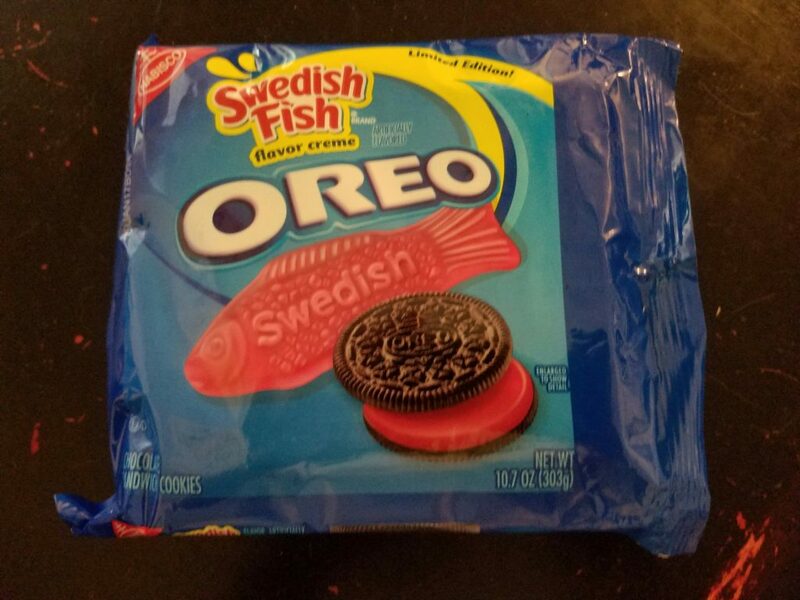 Swedish Fish are fine on their own, and original Oreos are a classic, but when you combine the flavors it’s clearly too much of a sweet thing. Waaaay too much of a sweet thing. 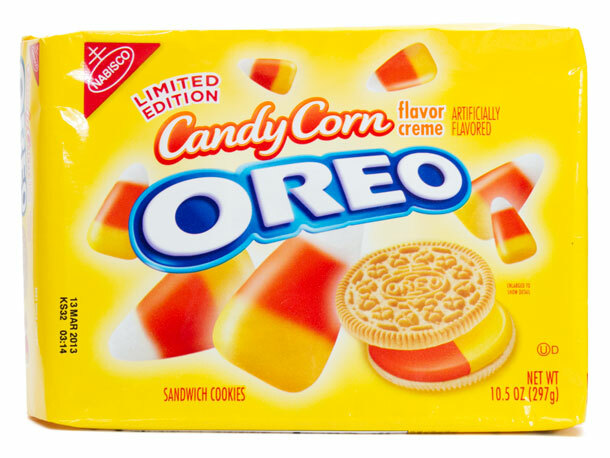 We’re talking instant hyperglycemia. 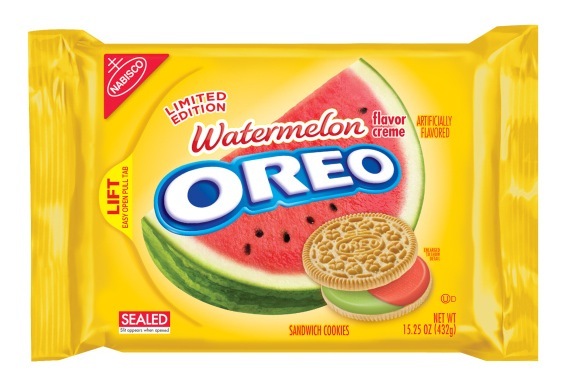 And the flavor combination isn’t quite as bad as orange juice + toothpaste, but it’s close. 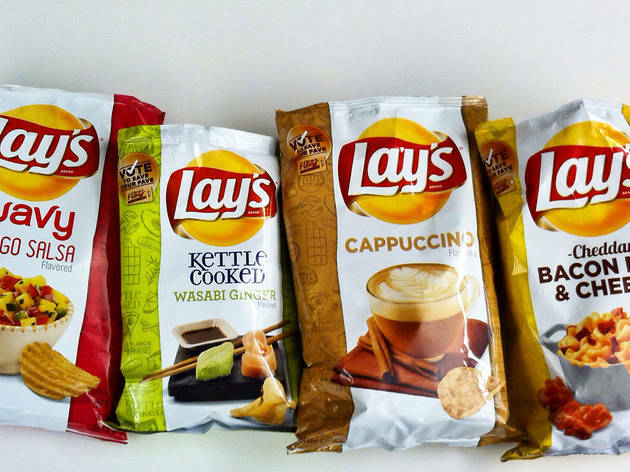 “I’d really like a handful of cappuccino flavored potato chips right now” – said no one ever! 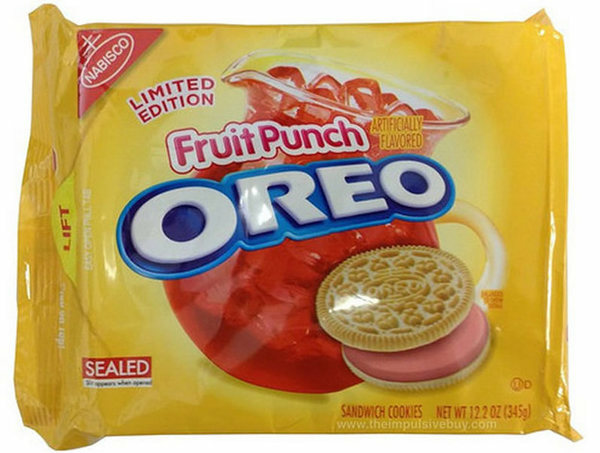 I wouldn’t be surprised to see Sriracha Oreos on shelves next summer. It’s a recent photo of our 15-year-old son Peter (he’s just being a goofball throwing up gang signs – love his sense of humor), contrasted with a photo of him from what seems like weeks ago, but in reality was nearly a decade and a half ago. 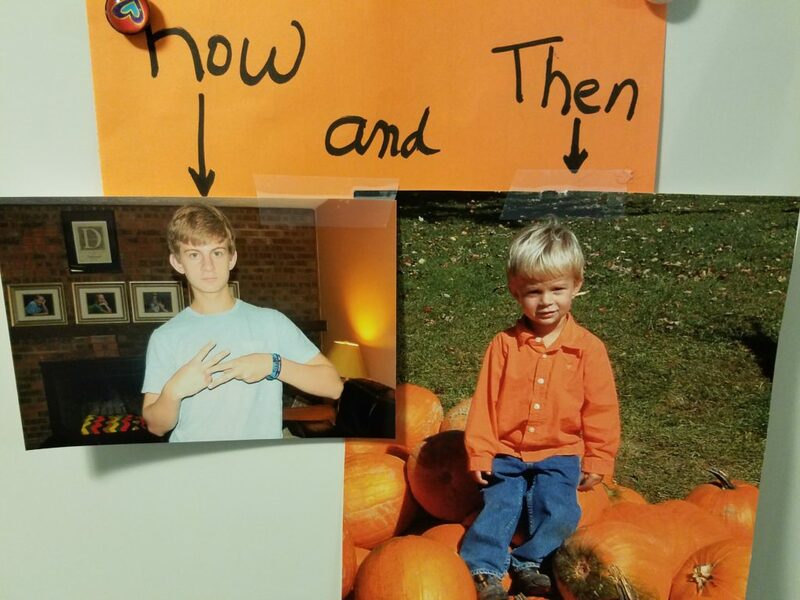 I know every parent says “it goes so fast” but I usually don’t think about it much, until I’m confronted with it every morning as I grab eggs out of the fridge. Sure, it makes me sad to realize that our babies are growing up, but it’s also a great reminder to cherish making Peter’s breakfast every weekday morning (2 eggs, scrambled, with cheddar cheese) instead of considering it a thankless chore. Soon enough, he’ll be getting his own breakfast at college (and it had better not be kegs and eggs!). This trip down memory lane made me think of a great tune from 22 years ago, a song by the Velvet Crush called “Time Wraps Around You.” (Never heard of the Velvet Crush? Neither has 99.4% of America – and that’s a crying shame.) It’s on one of my favorite “hidden gem” albums of all time, Teenage Symphonies To God. Leonard Cohen, the “songwriter’s songwriter” passed away earlier this week. His best-known song, “Hallelujah,” had an interesting gestation period. It first came out on Cohen’s 1984 album, but didn’t really make much of a splash. Jeff Buckley covered it in spectacular fashion a decade later, but it wasn’t until after Buckley passed away in 1997 that the song actually hit the mainstream. It was featured in the first Shrek film in 2001, but again there was a bit of a twist. A version by John Cale (Velvet Underground) was featured in the movie, but a version by Rufus Wainwright was on the movie’s soundtrack album. I think it’s great that Cohen was still writing and recording until the very end (his latest album came out earlier this year). I think it’s sad that he was cheated out of millions by his former manager and had to tour the world in his 70’s (387 shows from 2008-2013) just to try to replenish his nest egg.